← New Way Adds Sales Manager for Southeastern U.S.
2018 was the year of the pothole. It seems like every news station locally and nationally had extensive coverage on what they dubbed the “pothole pandemic.” A crumbling infrastructure in combination with dwindling municipal budgets and an extensive freeze thaw cycle has created the perfect storm for potholes and lots of them. Public works departments, county road commissions and state departments of transportation are fighting an uphill battle when it comes to pothole patching. Adverse weather conditions, lack of resources, asphalt plant closures and outdated methods are all factors directly contributing to the ever-challenging fight against potholes. Most municipalities follow a vicious pothole filling cycle that has been going on for decades. The most common pothole repair technique is referred to as “throw and go” and is exactly as it sounds, a shovel or two of patch material, usually cold patch, is thrown into the pothole and then onto the next one. The “throw and go” method has been used for decades and in the past has been a logical solution to filling potholes. However, because of the current state of the infrastructure, “throw and go” is no longer an effective or long-term solution to combatting potholes. Any municipality will tell you that it is not uncommon to fill the same pothole multiple times a week, and this has become accepted as standard. Although “throw and go” is the most common method, it doesn’t mean it is the most effective or cost conducive method there is. “Throw and go” misses a few critical steps that can make it go from a temporary repair to a long-term solution. So, what are the proper steps to pothole filling? Preparation is often overlooked but can be the difference between your patch lasting for a week versus your patch lasting for a year. The preparation step consists of cleaning and, if needed, applying tack to the pothole. By removing debris and moisture from the repair area, you are ensuring there are no environmental factors that will prevent the new material from bonding with the repaired area. Applying tack will create a tighter bond between the new material and the repair area. Most asphalt plants, especially in the northern half of the United States, close due to weather in early fall and do not open until the spring. This forces municipals to patch with cold patch material for those six to seven months while the plants are closed. 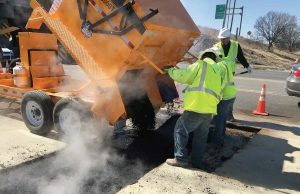 Contrary to the popular belief that municipalities have to use cold patch, there are other options out there that will allow a municipality to use hotmix asphalt yearround. Machines such as asphalt hotbox reclaimers give municipalities the ability to bulk store plant mix prior to the plant’s closing and then reclaim or reheat that material during the winter. An asphalt hotbox will also allow you to maintain asphalt temps for up to two days, so no more shoveling cold and sticky hotmix. 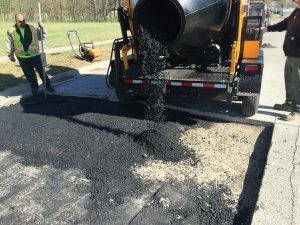 Hotmix asphalt that is applied at the recommended temps usually between 300 to 350 degrees Fahrenheit will create a tighter and longer-lasting bond between the pothole repair area and surrounding pavement. Taking it one step further, asphalt recycling machines can recycle millings and other asphalt byproducts back to their original plant-like quality. Those millings you use as base or on the side of roads can be recycled back into a high-quality patch material for winter-time patching. Another benefit is recycled asphalt on average costs 75 percent less than cold patch material. If you skip the compaction step, your patch will undoubtedly fail. By compacting your pothole patch, you are condensing the patch and eliminating or reducing voids for future water penetration to infiltrate and re-damage the area. Compaction doesn’t just mean hitting with the back of your shovel, it means using a hand tamp or preferably vibratory plate compactor or roller. KM International’s line of pavement maintenance equipment is a municipality’s first line of defense against potholes. A municipality looking for a long-term solution can benefit from KM International’s industry-leading line of asphalt hotbox reclaimers. By utilizing an asphalt hotbox, municipalities can not only maintain hotmix and cold mix asphalt temperatures for two days, but also reclaim/ reheat bulk-stored virgin hotmix overnight. KM International’s KM T-2 Asphalt Recycler is perfect for those municipalities with mountains of millings and other RAP asphalt material. The KM T-2 recycles 4 tons an hour and produces a plant-quality mix or better every time. Each ton produced costs approximately $25-30. Hundreds of municipalities, road commissions and state-level DOTs rely on the KM T-2 Asphalt Recycler to keep them supplied with hotmix asphalt year-round. Developing and implementing a preventative pavement maintenance plan is no longer an option for municipalities but a must. 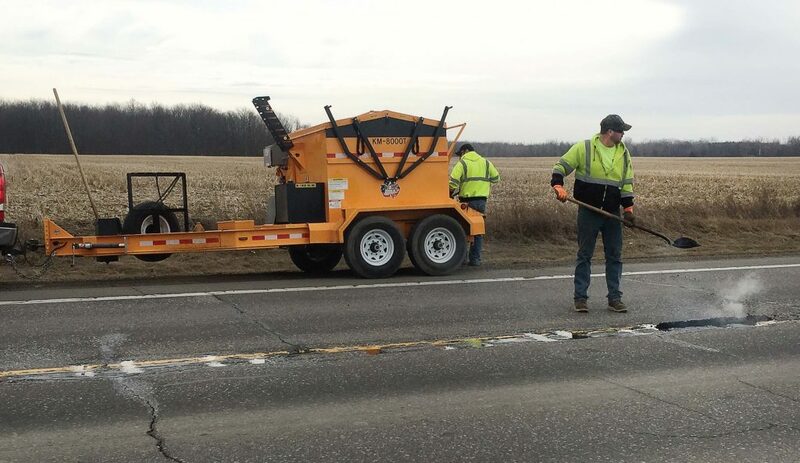 Because of steep budget cuts over the past several years, municipalities are being forced to work smarter in order to maintain roads and highways. Having a plan is the first step, and then having the right equipment and personnel is the next. With the right equipment, municipalities can save time, money and labor costs while still offering long-term solutions to potholes and other pavement defects. KM International has been a leading manufacturer in the pavement maintenance industry for 35 years. KM International’s experienced staff works with hundreds of municipalities across the country to provide equipment and knowledge to offer longterm solutions to age-old pavement repair issues. To learn more about KM International and its line of pavement maintenance equipment, call (800) 492-1757 or visit www.kminternational.com.